Boy is it hard to play catchup with this Londoner. 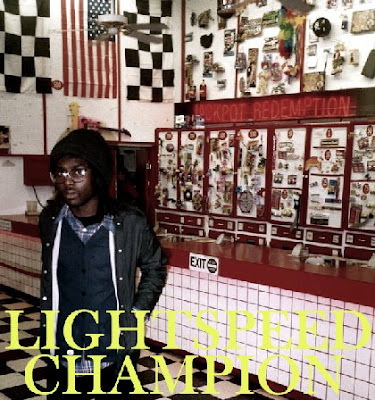 Lightspeed Champion (MySpace) has been around the world at a third of the legendary-but-short-lived punk band, Test Icicles, bounced back and fourth across the pond the divides the U.K. and the U.S.A. (for recording with Tilly & the Wall members in Omaha, no less), and has pretty much done everything else in between. Dev Hynes (who hails from London via Edinburgh and Texas bizarrely) released his alt-country/folk-pop EP, Galaxy of the Lost, way back in July, and it was an absolutely beautiful creation. Equal parts Fleetwood Mac/Hall & Oates and grungier groups like Nirvana and yeah, remnants of Test Icicles, Lightspeed Champion is truly a unique artist in his own right. His full-length, Midnight Surprise, is being released on Domino Records on October 15. Get it. It shall rock hard, but in a soft and subtle way. Or maybe it'll just be soft and subtle, but shoot your through with a uh ... bolt of blue? Anyway, grab a couple tracks below.